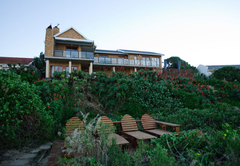 Sea Paradise is a 4 star graded B&B offering Wilderness accommodation in 6 guest rooms. 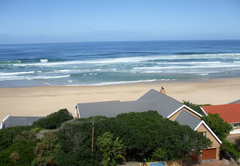 In the heart of the Garden Route, Sea Paradise Guest House is perfectly situated on the Wilderness beach front overlooking the sweep of golden sands. 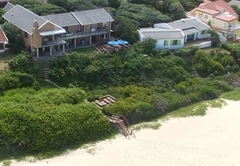 Beach front accommodation with swimming, fishing, walking and watching dolphins, whales, birds and all the people walking their dogs on the beach. 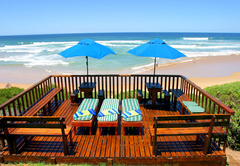 Each guest is provided with a sun umbrella and also beach towels. 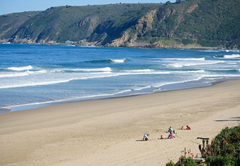 We do have surf boards and other beach games available. 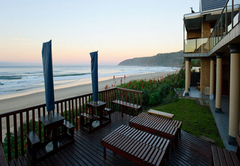 Enjoy panoramic views of the ocean whilst relaxing on the sundeck. 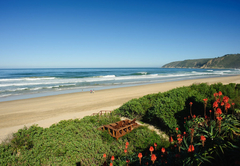 Spot dolphins surfing the waves or whales in season. 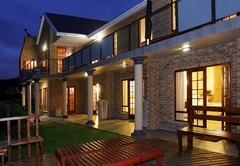 A short walk to the village, restaurants and other attractions from the Guest House. 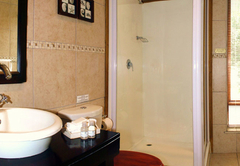 Large King / Twin bed en-suite bathroom ( shower only). Large king size bed with full bathroom (bath and shower) and fridge. There is also a sleeper couch. 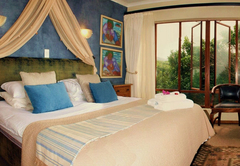 Large king / twin beds en-suite room (shower). Family unit / two rooms. 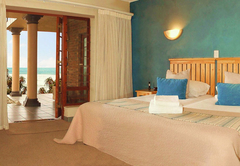 King and double bed en-suite room (shower) on first floor with a small fridge and balcony overlooking the 6 km Wilderness Beach. 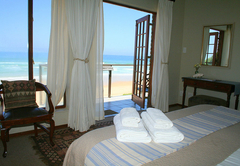 A lovely king size or twin bedded en-suite bath room (shower only) on the first floor with balcony ...overlooking the ocean. This room also has a bar fridge. 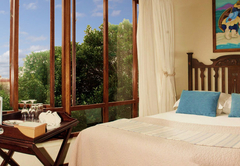 • All rooms face the beachfront. Breakfast includes a choice of continental and / or a full hot English breakfast. 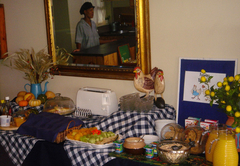 We serve quality produce, homemade produce and locally baked fresh breads. • The house has two TV lounges with DStv..
• Each room has a small security safe. We offer you off-street parking behind a remote-controlled security gate. • Wireless internet (WiFi) is available at no cost. 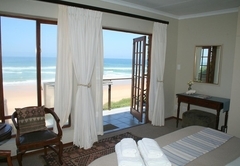 Beach front room on ground floor with twin or king size bed. En suite shower (no bath). Coffee / tea facilities, electric blanket and heating during winter. Beach umbrella/towels. Non smoking. Close to sun deck area. Beach Front room/ground floor. Large room with twin or king size bed. 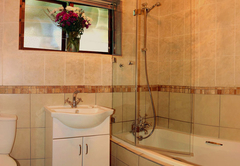 En suite bath and shower. Double sleeper couch for small children. Fridge/coffee/tea facilities. Beach umbrella & towels. Hair dryer. Electric blanket and heater. 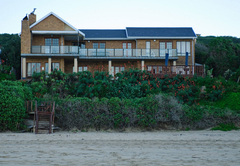 Beach front room on ground floor. Twin/king size bed and en suite bath and hand shower. 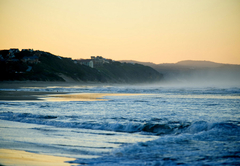 ; Coffee/tea facilities, Beach umbrella/towels. Hair dryer. Non smoking. Electric blanket & heater. Magnificent ocean/ beach view from room and balcony. 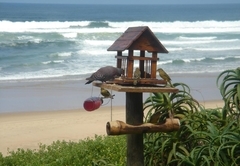 2 bedrooms sharing en suite shower (no bath). Twin/ king size bed & double bed. Small fridge, coffee/tea facilities. Beach umbrella / towels. Hair dryer. Electric blanket/heater. magnificent beach / ocean view from room and balcony. Twin or king size beds. En suite bath & shower. Coffee / tea facilities, small fridge, beach umbrella / towels. Hair dryer. Electric blanket / heater. Non smoking. Excellent location on the beach. A home from home. 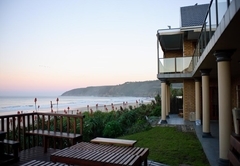 A luxury home on the beach!!! What else?? 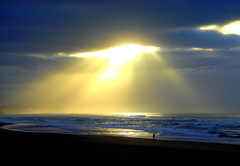 Response timeSea Paradise typically responds to requests in 5-10 minutes. Child policyChildren over 6 years are welcome.